Pop Art White Cheddar Jalepeno Gourmet Popcorn- Popcorn is always delicious! Especially when it's got white cheddar on it. Lundberg Shasta Chipotle Lime Multigrain Chips- I really like the Lundberg Rice and Bean chips but these aren't as good (in my opinion). I like the chipotle lime flavor. I just wish it was on a different chip. Stonefire Naan Original Naan Crisps- I love naan. If I go to and Indian restaurant, I really don't care about anything but the Naan. These don't taste like naan, sadly. Part of the deliciousness of naan is that softness. But these are crunchy crackers. Not too bad. Not too good, either. 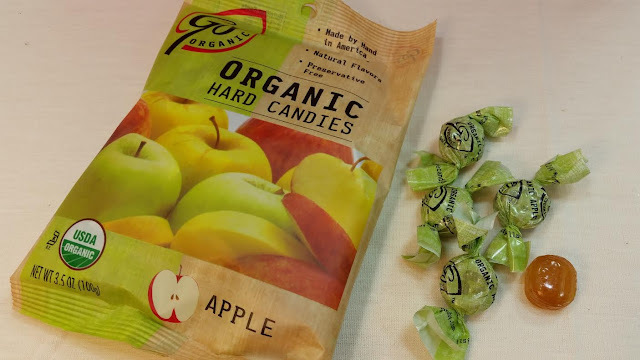 Go Organics Apple Hard Candies- These are small candies. They're pretty tasty but I find them very sugary. Each one has 20 calories, too. Just because it's organic, doesn't mean it's good for you! :D I'm pretty sure Barbara's Bakery Cheese Puffs are bad for me and I still love them. Even if they are natural. Or however I meant that. Bandar Foods Crisped Harvest Sea Salt Vegetables- I'm not one for vegetable crisps but my husband loves them. I gave these to him and he already ate the whole bag and said they were really good and could I get more. Hm. I don't know about getting more. I'll have to check. Pik-Nik Original Shoestring Potatoes- When I was a kid my mom would buy these at Payless (not the shoe store!) or maybe it was called Pay-n-Pack, in a big canister. Then we would go to the park and swing on the metal bench swing and eat these. I haven't seen them in decades so it was fun to remember those times. Enlightened Roasted Broad Beans- These were strange. I mean, they're beans. I like beans. They're flavored Garlic and Onion. I like that taste. But they were just a little weird texturally. Apparently "texturally" is not a real word. Oh, well. Olympos Pitted Greek Olives- Um. Olives. Gross. Kind Bar Popped Salted Caramel Healthy Grains Bar- I've been wanting to try these even though Salted Caramel is not my favorite flavor. 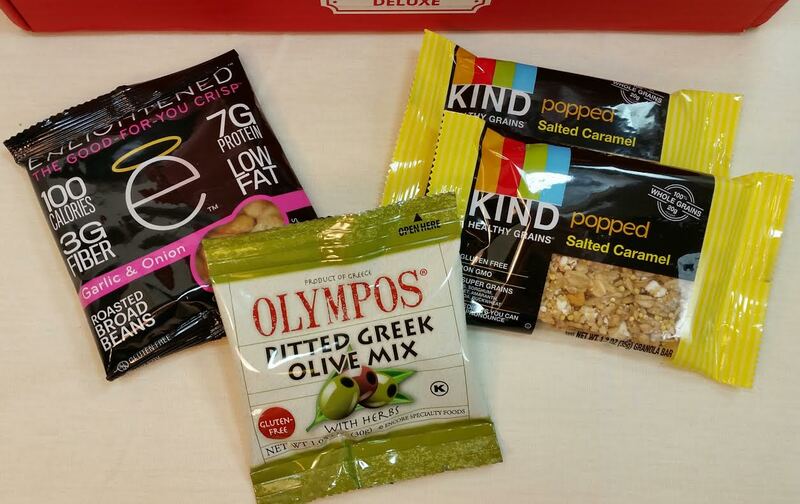 I do love Kind bars. The Cranberry Almond ones are my fave. I wish I wasn't so full from my other snacks or I'd rip one of these bars open. 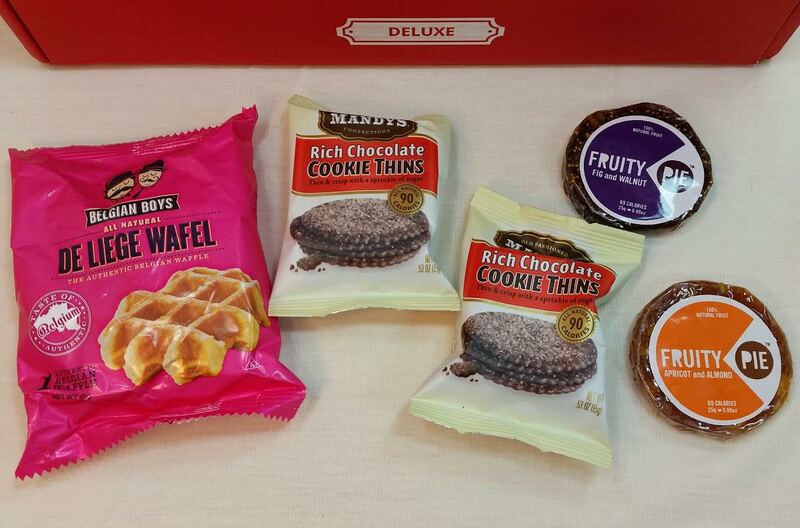 Mandy's Rich Chocolate Cookie Thins- I've received these before although I don't know if it was in a Love with Food box. 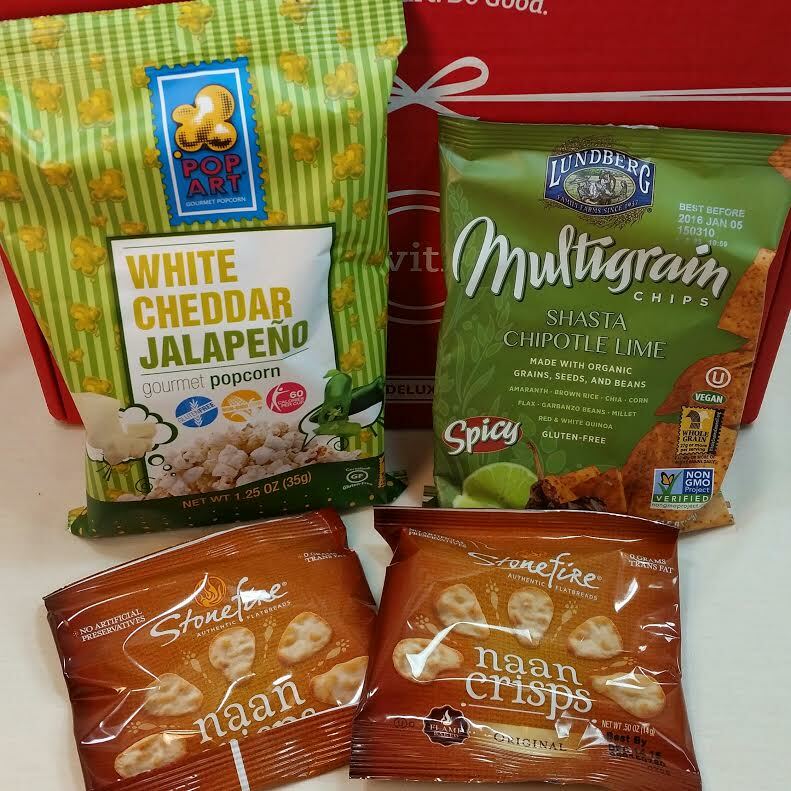 I get a lot of snack subscriptions. These are dark chocolatey, crispy, thin cookies with sugar sprinkled on top. They're like extra tasty Oreos. Without the stuffing (which I don't like anyway). I Love Snacking Fruity Pies- Mooshed up fruit with nuts. One is fig and one is apricot. I'm not a fan of figs but I like apricots. I guess these are like chunky fruit leather? I haven't eaten one yet because I'm a little intimidated. VERDICT: I'm going to miss the Deluxe box if I really decide to stop getting it. There are so many snacks in this box. It's always an adventure. Between my husband and I, the box contents usually get nommed pretty quick. Except for the olives. Neither of us will touch those. (I already put them in the trash). I think this is one of the best natural/organic type snack box out there right now for the price. 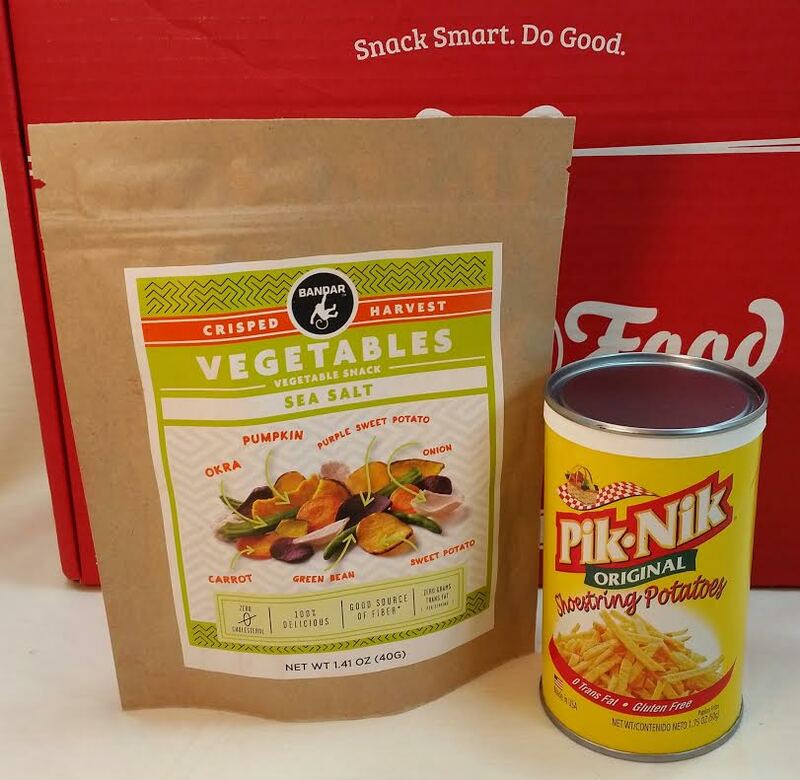 You can sign up and get your own Love with Food box right here. Get 40% off your first Tasting Box here. No deals currently for the Deluxe box, sadly, but check Groupon because sometimes they do. If you want Gluten Free snacks, you can get your first box for 50% off here. 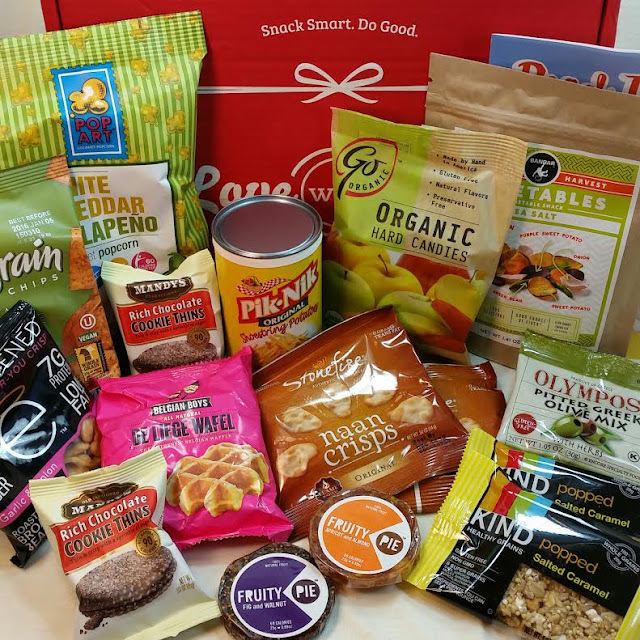 The Gluten Free box has 8-12 certified Gluten-free as well as naturally Gluten-free items. The items included in the box will be both single serve and full size portions and may include snacks, ingredients, cooking mixes, beverages and more. Hi! Bandar Foods here. Thanks for the great review! Thrilled your husband liked our Veggie Crisps. You can always find more at our website (www.bandarfoods.com) or on Amazon. You can also try our version of Naan Chips (which hopefully you like better!) Thanks!